We’re kind of digging "The Dirty Politician" as his new wrestling name. 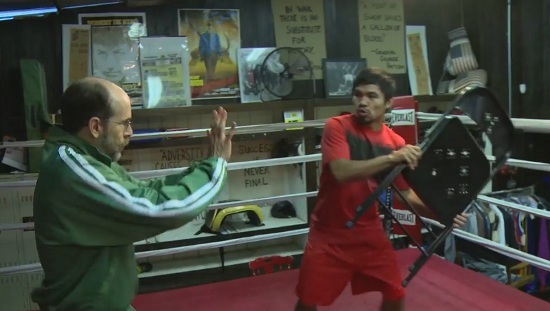 (SPOT.ph) Clearly, Manny Pacquiao is a man of many, many talents. He’s one of the greatest boxers in the world. He’s a congressman who may or may not run for higher office. He’s the head coach for a team in the Philippine Basketball Association where he, apparently...uh, contributed absolutely nothing. He’s a recording artist who’s gone platinum, played judge at the recent Miss Universe pageant (where he asked a very thought-provoking question on terrorism), and he has his very own documentary. He is now looking to add another bullet point on his already-extensive resume: professional wrestler. He’s even enlisted the help of pro-wrestling coach Chet Carmichael, who had Manny try different gimmicks for his wrestling persona, including "The Dirty Politician," "The Man-ny," and "The Diva." What career do you think Manny should take on next? Filmmaker? Painter? Couture fashion designer? Award-winning actor? The possibilities are endless.